Bright and early on our first Saturday in Bali, we headed over to hip and happening Seminyak to spend the day with a friend visiting from Dubai. We decided to go to the beach in Legian so the kids could have a bit of fun on the sand. Blue Ocean Beach is the beginner surfer’s beach and lots of surfer schools are set up there. After lugging our stuff to some sunbeds ($2.50 each) and getting the umbrellas set up, we settled in to watch the surfer show – lots of people riding the waves but also lots of beginners crashing in the water (as you can see in the photo above). The tide was high and there wasn’t much beach (sand) left but we were told that the it would be low tide in a few hours. 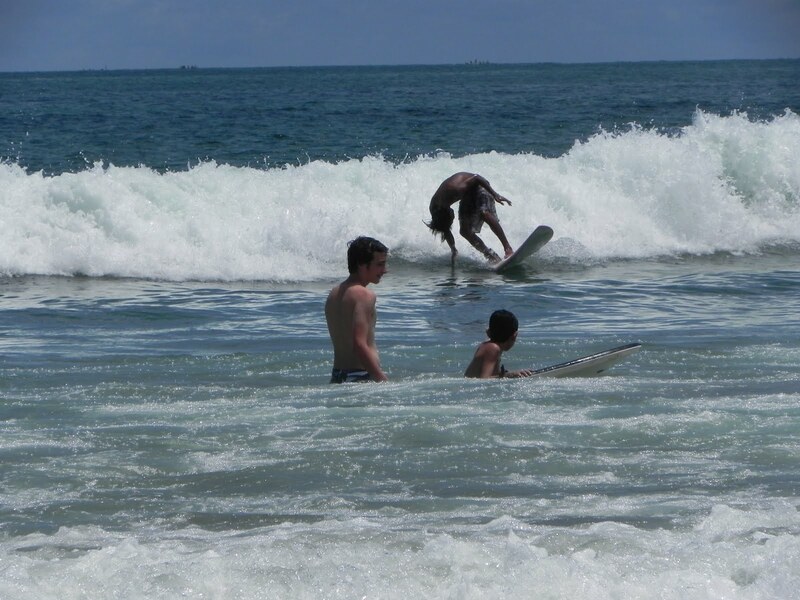 The boys went straight in and tried their luck with a boogie board while we girls, sat around and chatted away. 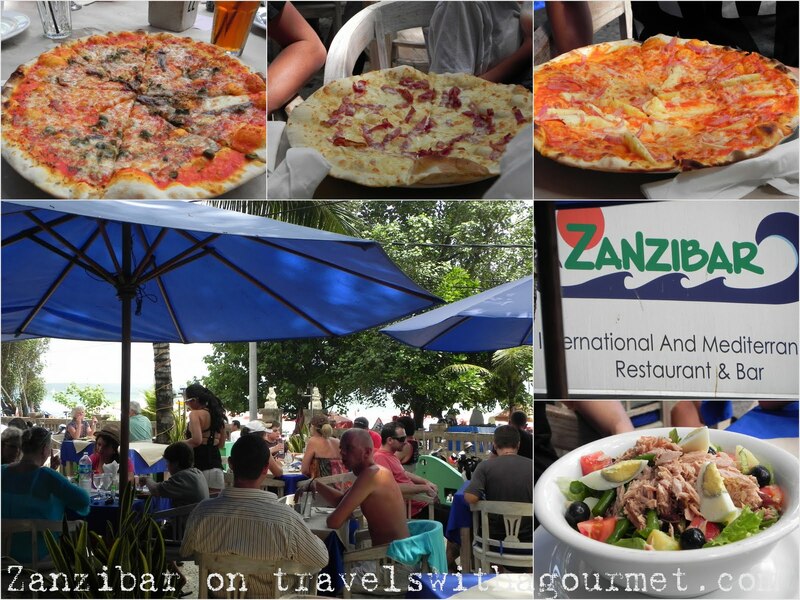 When we all got hot and hungry, we walked across the street to Zanzibar, a long-time favorite of Bali residents and well-known by surfers for it’s convenient location right on the beach. The place was packed with expats and tourists enjoying the meal and the free WiFi. The large outdoor terrace was full but they also had an upstairs lounge/terrace with a pool table. The menu at Zanzibar is varied with lots of salads, sandwiches, pizzas and a few Indonesian specialties. The kids had smoothies and pizza (around US$5) and we all had the Nicoise salads plus lots of iced lemon tea. I hadn’t updated any of my iPhone apps in a while so I took advantage of the WiFi as well while waiting for the food to be served. We ate quickly and then went back to the beach where the tide had gone out and much more of the beach was exposed. It was nice to have the tide out but it also left a lot of trash, mostly plastic, on the sand and although someone was rapidly sweeping away the bits of plastic, the beach didn’t really look that good so we packed up and went back to Sentosa Villas where R has her holiday home. Good thing that we did, because it started to pour soon after. But as we’re in the tropics, we all went for a rainy swim anyway the rest of the afternoon. Open daily from 7:30 a.m. till midnight.